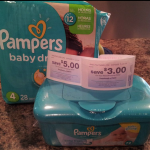 You are here: Home / Uncategorized / Hot Pampers deal at Kroger! There are rarely deals on Pampers, so I thought I’d share this deal that you can get at Kroger this week. The promotion is: Spend $25 on participating Procter & Gamble products, get $5 off instantly. I’m not sure what the end date of this promotion is (I forgot to check the tags at my store), but you’ll want to do this before 12/31 because several of the coupons expire then. Pampers were $9.77 for the jumbo packs at my store. There were $2 off coupons in the 11-29 PG insert (these expire on 12-31) and $2 off coupons in the 12-27 PG insert. There were also $2 coupons in the PG Year of Savings booklet. STOCK UP DEAL on Pampers Diapers & Wipes at Kroger! Save 30% on Pampers and Luvs diapers!